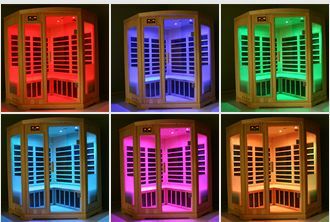 Far Infrared Saunas - The Healthiest and Safest Far Infrared Saunas In The World! *STOP BY OUR SHOWROOM AND SEE OUR SAUNAS ON DISPLAY! * Also Available With Steam & Infrared! 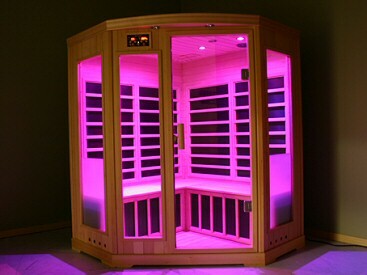 Infrared Saunas Cost Far Less To Own! Just Pennies Per Use To Enjoy Your Own Personal Sauna! Easy Set-up & Use! Uses Standard 120volt Home Wall Outlet! Whether you use your sauna to wind down after a stressful day at work, after a workout to reduce pain in muscles and joints, to detoxify for a healthier body, or before bed to promote a deeper, more restful sleep, let a Saunatec Far Infrared Sauna work its special effects on you. All infrared delivery systems produce EMR and EF to some extent. While the levels are typically low, it is still not clearly understood what the long-term effects of low exposure might mean. Pure Infra technology was developed to take the worry out of unnecessary exposure to EMR and EF. For instance, the electrical field in a Pure Infra is less than you’d experience from a computer screen or cell phone. After all, if the point is to detoxify, why expose yourself to any level of unnecessary radiation? 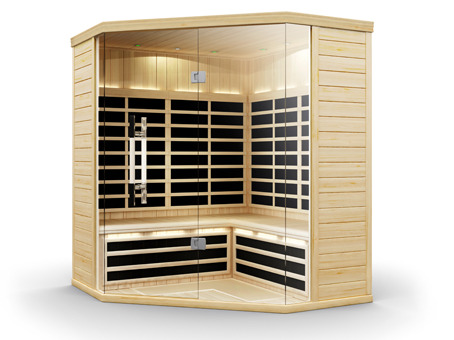 In fact, the EMR and EF levels in your Pure Infra Sauna are lower than the ambient in your home. Your Sauna becomes your ‘safe’ haven. We were first in the industry to introduce proprietary Low EMR/EF technology, which was market driven by the Canadian Medical Community, successfully developing technology with 4 patents in the US, Canada, and Europe. Our Lowest EMR/EF in the world has been verified by Intertek. These advancements truly changed the infrared sauna industry. While many competitors have tried to copy the design, Finnleo remains the leader. Treating yourself to the relaxation and detoxification benefits of infrared technology is now safer than ever. 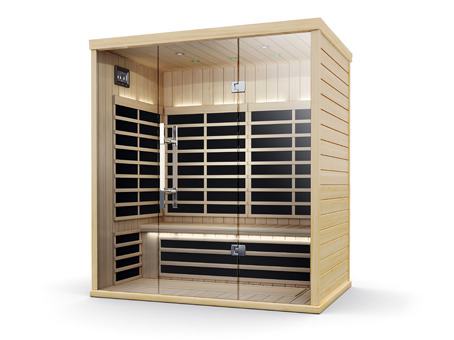 Pure Infra saunas have the lowest electromagnetic radiation (EMR) and electrical field (EF) signatures of any infrared delivery system available. Levels far below even Sweden’s tough radiation standards. And the exclusive EvenHeat™ system makes sure every single part of you is warmed evenly heated providing added comfort and true full body detoxification without the worry of excessive exposure to EMR and EF. 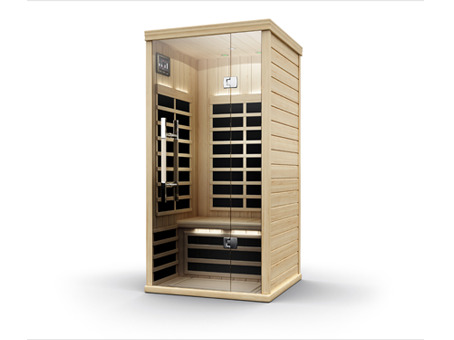 The Original Premium Line set a new standard in infrared sauna design and performance. The new Low EMR/Low EF B-Series is superbly designed, has high quality craftsmanship and materials, and is loaded with standard features (see below). Saunatec Carbon Flex heating system, integral with wall panels and bench support panels – with the largest surface area in the industry, providing the softest heat, evenly dispersed from all sides (no hot spots; no cold spots). AM/FM/CD/MP3 stereo system, with unique "drop down” system (stereo recedes into ceiling panel), and with easy-to-use remote control. 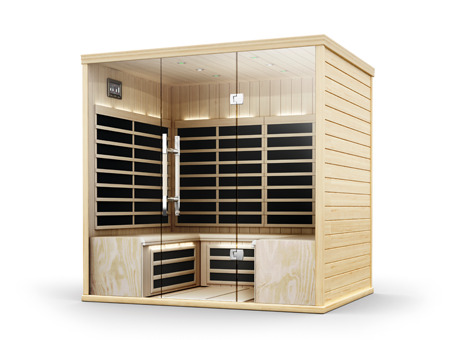 Finnleo introduces a line of new Low EMR/Low EF Infrared Saunas. EMR (Electro-Magnetic Radiation) and EF (Electrical Field Radiation) have been reported to have potentially negative effects on a person's health. 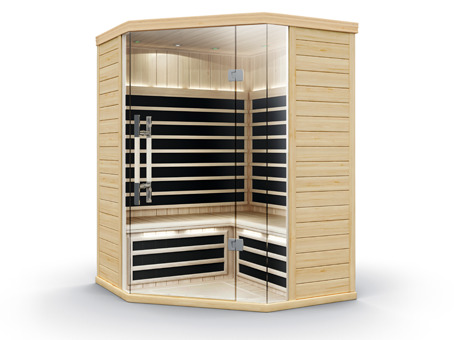 With increased energy efficiency and low EMR/low EF, the new infrared saunas provide a healthier sauna experience with a lower impact on your energy bill. 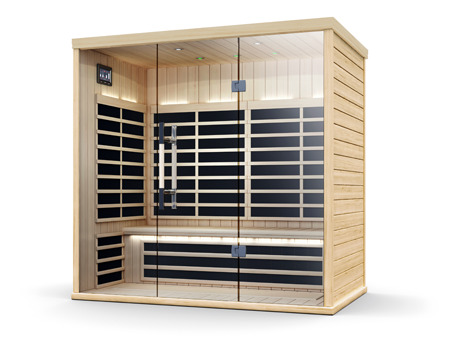 Available in 7 models, the patent pending Low EMR/Low EF Infrared Saunas are the only infrared saunas in the world that exceed the Swedish standards. Far-Infrared is perfect as a "heat therapy room” for athletes looking for a pre-workout warm-up – to warm up muscles and increase flexibility, helping to prevent injury. It’s also ideal for pre-warm-up for physical therapy and massage therapy, or for a relaxing wind-down at the end of a stress-filled day. 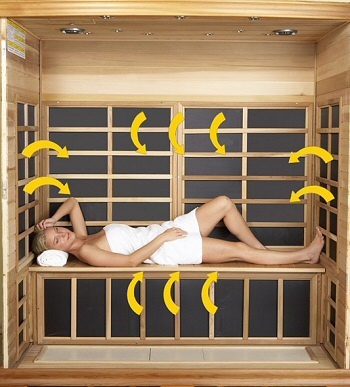 Far-Infrared heat is also ideal for soothing sore muscles and joints after a workout. A Saunatec Far-Infrared sauna provides soothing heat, directly radiated to the body, with almost no time waiting for preheating. 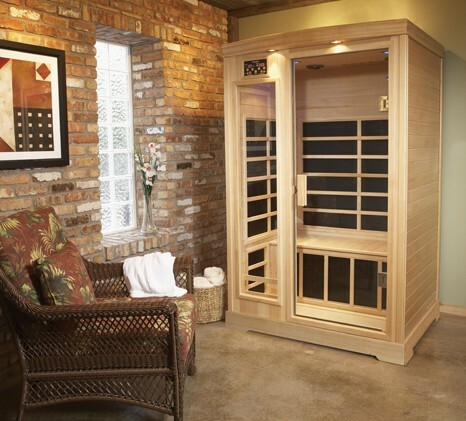 The far-infrared radiant heat induces a deep sweat – for cleansing and detoxifying the body and for burning calories. 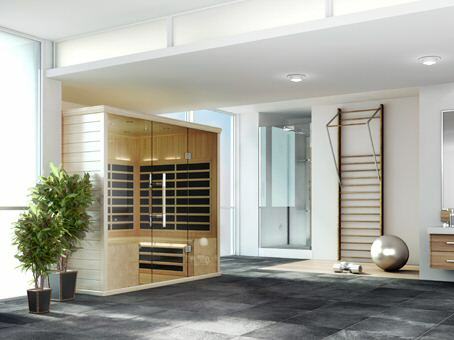 Using the latest Japanese far-infrared technology, Saunatec’s CarbonFlex heating panels have the largest surface area of any IR sauna heating system – providing the softest heat. Saunatec’s CarbonFlex performs better than other IR systems, with a near-perfect wavelength of 8.4 to 9.4 microns (well within the "Vital Range” of 7 to 14 microns). This optimal wavelength provides for deeper penetration of far-infrared heat – which, in turn, can enhance detoxification, cardiovascular conditioning and relief from muscle and joint aches and pains. Psychological and therapeutic effects of Colors has been provided with permission by Healthstart Life Products, Australia. NOTICE: We have provided the information here for reference purposes only and to stimulate further investigation. No implication of Saunatec's Infrared Sauna creating a cure for or treating any disease is implied nor should it be inferred. If you have a health issue always consult your doctor for medical advice. GREEN is a cooling, sedating color, which helps reduce swelling of joints and tissues; it calms the body and helps reduce inflammation. It’s the color of the relaxed heart. TURQUOISE is the color for mental relaxation and tackling embedded psychological barriers. It can help regulate imbalances in the lung and large intestine system. It can facilitate spiritual growth. VIOLET promotes awareness and consciousness. It increases effects of meditation. It promotes proper functioning of the lymphatic system and can be helpful in times of menopause. "Design” is the most obvious reason to choose Finnleo. But design is more than skin deep. There are no visible external buckles. 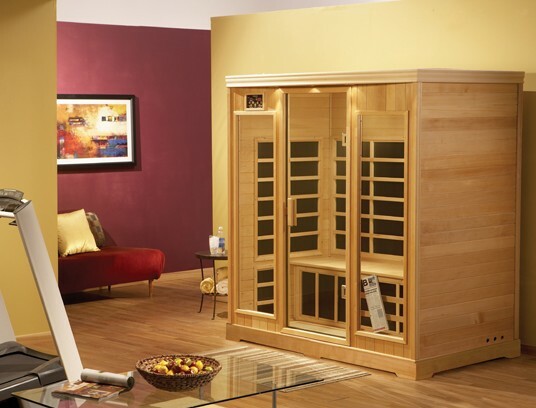 Furniture quality detailing includes the fine-grained wood throughout, custom-made molding, comfortable seating, doors and windows that are thoughtfully designed to complement the sauna. 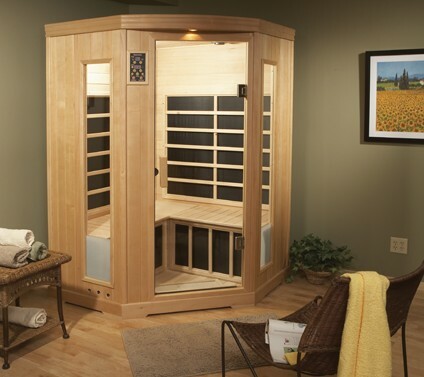 Not only do you get the finest Far-Infrared sauna available, you get the company behind the product. With so many companies "here today, gone tomorrow”, isn’t it reassuring to make such an important purchase from the world’s largest and oldest sauna company? Since it’s beginning in Finland in 1919, Finnleo/Saunatec has been a world leader in sauna innovation, technology and design. 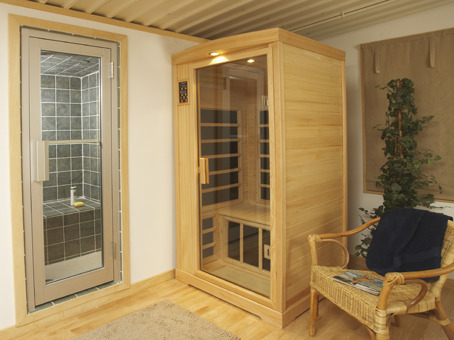 The benefits of sauna therapy are almost immeasurable. Indulge and invest in your good health…in something that not only feels good, but is good for you. 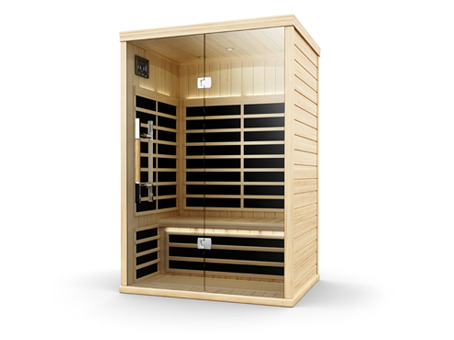 The “Premium Line” by Saunatec is a new generation of Far-Infrared Saunas - using the latest in organic carbon technology – designed to give you the ultimate IR Sauna experience. 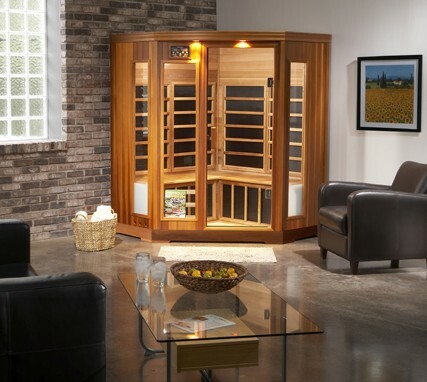 Contact us or stop by our amazing showroom where we have Finnleo infrared saunas on display, the finest spas, top of the line above ground pools and a large selection of parts, supplies and accessories for all of your needs.